We limit our inventory to ensure that our homeowners and guests receive the best service at all times. You will never find a key under the mat or have to call us multiple times to get an issue resolved. We as owners are involved in everything from making sure our homes are well maintained to welcoming all of our guests to immediately responding to any concerns or issues. Communication is always a top priority for us. We pride ourselves on building lasting relationships with both our homeowners and guests. My husband and I have been renting in this area for the last 10 years. 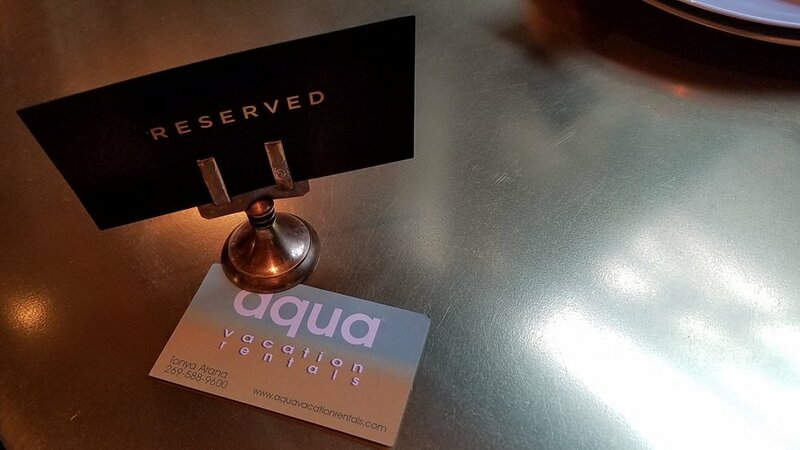 We used other companies but we were so excited when we found Aqua Vacation Rentals. They always meet us at the house to welcome us back, let us know about what is new in the area, leave us treats or fresh flowers and are always very responsive if we need a new tank of propane or have an issue. We have rented a few different homes from them and are always very impressed at how clean the houses are. The attention to detail from the housekeeping staff and little touches are noticed throughout the houses. We know we can start our vacation the minute we walk through the door and not have to worry about cleaning. We always feel at home in Aqua Vacation Rental homes and Tonya and Henry’s love and passion for their business is very evident! We look forward to staying again next year! Enjoyed this lovely, cozy summer cottage with my daughter for a 3 day relaxing getaway. We loved the details and great condition of the cottage, its cleanliness and quick,efficient service in booking and arrival at this rental. Location is fabulous and were able to walk to everything we wanted to do. Will definitely plan on returning to Serendipity and aqua rentals . This property was great. It had all the space we needed and more. The screened in porch was so peaceful and the 10 minute walk to the beach was perfect to work off the extra vacation calories. The beds were comfortable. Anything we needed was taken care of as Tonya was always quick to answer any issues. Weather was perfect and the Lake was just the right temp. Kids swam everyday. What a wonderful rental property! We rented this house for my mother's 85th birthday celebration. The home is spacious and accommodated everyone very comfortably. The location is secluded , The garage has a ping-pong table, plenty of bedrooms and a hot tub. We would definitely rent this location again. Tonya was amazing and would get back to us immediately about all our questions. we even got complementary passes to the public beach and a local winery. Would highly recommend! Rent so many times in the area an all their homes are always super clean, we can't rent from any one else. We spend all our time in the pool and had wine on the beach to watch the spectacular sunsets! “We stayed at this property for a weekend getaway, the place was really clean, had everything you'd need at an away place like this, location was ok too, close to Lake Michigan, a local river with kayak and paddle board rentals, bike rentals and a few minutes drive to new buffalo; we'd definitely be back there and we highly recommend this for anybody interested in renting in the area. And I wanna thank Tonya for her help after we got there, telling us everything there was to know about the area and attractions and everything we could need during our stay. We recently stayed at Howie's Place for 4 nights. It was the first time that we and my husband's parents, siblings and their children were all in the same house! We all had a wonderful time. Tonya, the representative from Aqua Vacation Rentals was awesome throughout the whole process, from booking, to arrival, to checkout! The house is older but has lots of updated areas and is very well stocked. There were plenty of dishes, silverware, cooking equipment, and utensils (even a Ninja blender!). There was also an abundance of towels, beach towels and bed sheets. There's no need to bring anything! We were also supplied with all the basics like toilet paper, paper towels, dish soap and laundry detergent. These supplies lasted awhile but if you're there longer than just a few days or are picky, bring some of your own. The location of the house is fantastic. The back yard is nice and big for the kids to run around, the neighborhood was nice to walk around, and the private association beach area is about a 5 minute walk. This beach is pretty rocky but there is some sand and our kids had a great time playing and swimming there. It can get pretty crowded but other guests were all very friendly. The public beach is within walking distance (probably 15-20 minutes) but only about a 5 minute drive. There were 2 parking passes available to us, otherwise it's $12 to park. The public beach gets very crowded and the sand for the most part is okay. It appears as if the beach area isn't groomed...watch for the duck and goose poop! There are some sand dunes to climb which offer great views of the lake and city. Just want to mention two warnings: the stairs in the house are very narrow and steep and not carpeted so pay attention and hold the railing! Also, the hill to get to the private beach is very steep and rocky! Overall, we were very pleased with the house and had a great vacation! We are looking forward to coming back! This is our favorite New Buffalo rental, and we've been coming to Harbor Country for 15 years. First of all the location could not be better. Once you park at the condo, you can actually have an entire vacation without using your car again. It is probably 100 steps to the Amtrak if you want to take the train to Chicago. If you're trying to get away from Chicago, the beach is probably a 4 minute walk and a 1 minute drive. Great restaurants are steps away, Our family particularly enjoyed Casey's, the Stray Dog, and the Bentwood Tavern at the Marina Grand. But on to the condo. It is very nicely decorated, with art on the walls of cool old postcards of historic New Buffalo. The furniture is modern and more classy than you would expect of a rental. The beds were top notch and very comfortable. All the plates and glasses are high quality and there is enough to entertain, as well as all the cookware you could ever need. There are great views of the Galien river and even Lake Michigan views from the balcony. They are very relaxing. There are even a bunch of puzzles, board games and DVDs, as well as Netflix, Google Chromecast, and Wii, if you happen to get a day of rain. Tonya from Aqua was very thorough in explaining everything, from the cosmetic towels, to the electronic beach pass which saved us tons of money. We've spent a great deal of money staying at the Lakeside Inn, Harbor Grand, Marina Grand, and other homes away from the beach over the years, but this is definitely the way to go. Enjoy! Tonya was sooo terrific! She helped with outing suggestions, grocery options and directions. The rental house was beautiful, clean, and had everything we could possibly need! Our group of 4 couples had a great time and couldn't have asked for a more perfect large group setting! We look forward to a repeat trip! The hot tub was fabulous! Thanks for a great get away! Best place ever rented, Tonya was great and so was the house. We all hated to leave, but brought back many pictures and memories. Thank you Tonya again.